Lots of Lavender has been such a popular choice for sale-a-bration and it's not hard to see why! I love the soft, whimsy feel of this 2 step set. You stamp the outline of the image and then stamp over the top in a coordinating colour. My card was inspired from one I received from my team leader for my recent promotion and I just loved it so much I had to make some more of my own! I did a couple of colour combinations - wisteria wonder and sweet sugarplum (I am so going to miss this colour when it retires soon!). I then used the light Old Olive blends pens to colour the leaves. 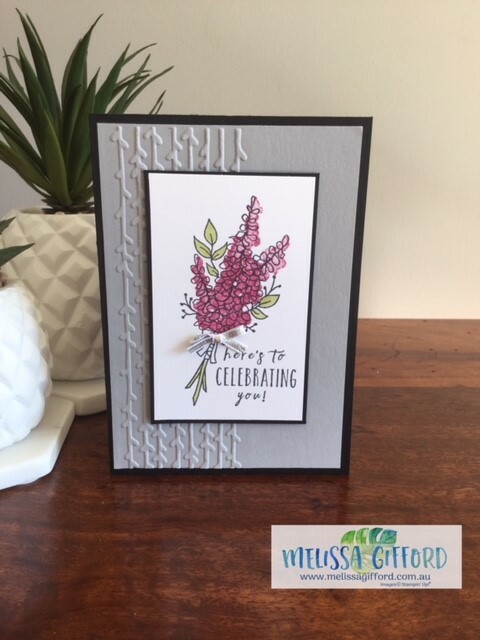 The embossing is the Petal Pair textured embossing folders embossed onto smokey slate cardstock. The sweet sentiment comes from Perennial Birthday. Get your set for FREE with a $90 order but only until Saturday 31st March. Shop here 24/7 or click on any of the thumbnails below.